Google has cited Apple's Siri voice assistant as an example of why it believes that it should not be being investigated by an anti-trust committee in the US. Google's dominance of the search engine has led to a probe by the authorities into whether it places its own properties higher in its own rankings, but chairman and former CEO Eric Schmidt pointed to Siri as an example of the way in which the business is evolving. Schmidt's statement, published on Google Docs said: "Moreover, history shows that popular technology is often supplanted by entirely new models. "Even in the few weeks since the hearing, Apple has launched an entirely new approach to search technology with Siri, its voice-activated search and task-completion service built into the iPhone 4S," he added. "As one respected technology site reported: "[E]veryone keeps insisting that Apple will eventually get into the search engine business. "Well they have. But not in the way that everyone was thinking. 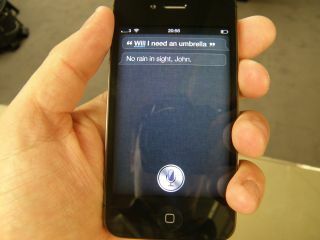 Siri is their entry point." Another commentator has described Siri more simply as intended to be a "Google killer." The two cited sources, by the way, are TechCrunch and Forbes. Schmidt then told the committee that Google was under pressure to be high in the rankings, insisting the whole premise of favouring its own products is based on an 'inaccurate premise'. "These universal search results are our search service—they are not some separate 'Google product or service' that can be 'favored.'" said Schmidt. "The fundamental openness of the Internet places powerful competitive pressure on Google to ensure that our search results are those that are most responsive to what users are looking for."